Eventual winner Matthew McClintock (right) of Madison High School and Mike Tate of J.H. Gillis Regional High School in Antigonish, Nova Scotia, were at the head of the pack just seconds after the start of the boys seeded section race of the Maine Cross Country Festival of Champions in Belfast in October 2011. BELFAST, Maine — Race director Glendon Rand jokes that if he known what kind of monster he was creating when he dreamed up the idea of the Maine Cross Country Festival of Champions in 2002, he probably would have thought twice. 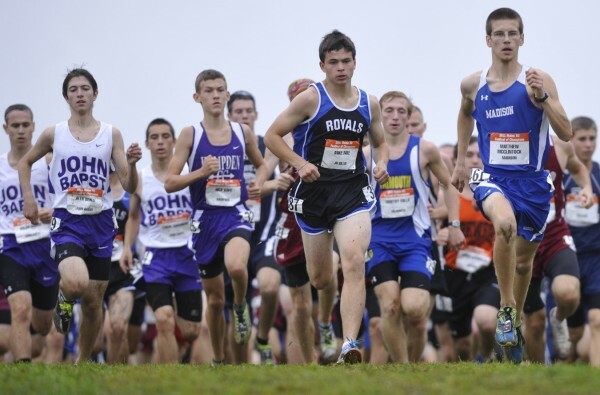 That’s because 11 years after its creation, the series of races not only is one of the most highly anticipated events for high school runners, it is the largest competition held in the state for athletes in grades 9-12. On Saturday, more than 1,600 runners from 72 high schools in Maine, Canada and two other New England states will converge on Troy Howard Middle School for the 11th annual Maine Cross Country Festival of Champions. The longtime Brewer High School coach has watched the field grow from 24 teams at its inception to 72 this fall. He even had to turn away a few teams this year to keep the meet manageable. The list of competitors is heavy with Maine teams, but there also are squads and competitors from Rhode Island, Vermont, Nova Scotia, Prince Edward Island and Newfoundland. The Festival of Champions features a unique format. Six races, all 3.1 miles, will be contested during the course of the day. Separate competitions for girls and boys are scheduled in seeded sections and unseeded sections among varsity runners and two freshman races. That ensures a more equitable division of skill levels in each race. The result is six races with approximately 150-250 competitors in each. Due to the large number of runners in each race, organizers take extensive measures to make sure things run as smoothly as possible. He explained that Belfast coaches JoAnn Nealy and Henry Bouchard, along with Dale Nealy, organize the details at the Howard Middle School, including course setup and the awards ceremony. Rand said that in spite of the high caliber of competition, particularly in the seeded races, the meet does not come with a lot of pressure for the participants. Music is played prior to the races and the teams are introduced before the start of each run. Depth across the board is pivotal for schools that hope to contend for team titles because of the scoring format. The top five runners from each team, in all of the six races, are counted toward the team total — as if it was being scored as one huge meet. Rand said the freshman races provide some of the younger runners with a chance to compete in a different environment that is theirs for the taking. “They get in the freshman race and they run faster than they normally would and they’re not inhibited by the kids who they are ‘supposed to be behind,’” Rand said. Keeping score of the meet is not a problem, since organizers use Doug DeAngelis’ state-of-the-art FinishLynx and IdentiLynx electronic timing and cameras systems. Rand explained that each runner not only wears a numbered bib, there is an Ipico chip on one shoe and a stick-on number on the shorts of every participant. “We have times to the 1,000th of a second on every runner,” he said. The meets will include not only many of the most talented runners in Maine, but some high-caliber competition from Canada, along with Vermont and Rhode Island. Mount Desert Island, the 2011 Class B state champion, returns in the hope of defending its Festival of Champions team title on the girls side. The Trojans’ top runner is junior Maggie Painter, who is seeded No. 36 at 21 minutes even. However, depth is the key and MDI has a handful of runners bunched at 21:30 in the seedings. Camden Hills and 2011 Class B individual winner Brittany Bowman (19:38.75) is the No. 8 seed. Bonny Eagle of Standish, a potential Class A state championship contender, is another top entry. Among the individual front-runners is Bethanie Brown of Waterville, who owns the best time in the state this season at 18:35 and is seeded No. 1 at 18:00. She’ll be chased by the likes of senior Molly Schassberger of Winslow and junior Aleta Looker of Ellsworth, along with Shannon Conley and Kiera Murray of Cheverus High in Portland and senior Jillian Forsey, a senior from Stephenville, Newfoundland. The boys competition includes defending champion Falmouth and a talented crew led by Bryce Murdick and Jay Lesser. J.H. Gillis High of Nova Scotia, paced by senior Mike Tate, also is likely to be a contender along with Cumberland, R.I., which boasts the top individual seed in senior Trevor Cawley with a time of 15:46. And don’t count out Lewiston high with Mohamed Awil and Mohamed Barre. Others who appear positioned to challenge for the individual crown are junior Josef Holt-Andrews of Telstar High in Bethel, Ellsworth junior Dan Curts and Mike Tate of J.H. Gillis. For information on the Festival of Champions, visit sub5.com.